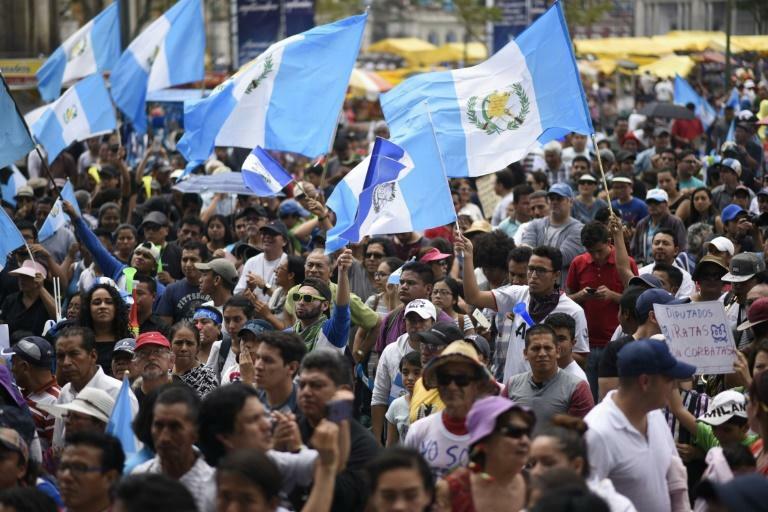 Street protests demanding President Jimmy Morales step down erupted across Guatemala on Friday, as the country celebrated its 1821 independence from Spain. The demonstrations come after months of opposition directed at Morales and several lawmakers who are under a cloud of corruption suspicions being investigated by a UN-backed commission. They were also spurred by changes the country's congress had tried to make to criminal laws on corruption that would allow convicted politicians to avoid prison. In the capital, some demonstrators yelled that "Guatemala is in mourning because of these corrupt people." Under the legislative changes adopted on Wednesday, politicians would be shielded from charges of illegal funding, and any convicted of corruption and sentenced to up to 10 years would have the option of paying bail to stay out of prison. But a court on Thursday suspended the changes, which many citizens denounced as a "pact for the corrupt." And late Friday, congress withdrew the controversial reforms, according to the speaker, Oscar Chinchilla. Public indignation at the actions of the elected officials was already heightened after lawmakers had rejected a request by Guatemalan prosecutors and a UN body to have Morales' immunity lifted to face a corruption probe. Morales himself had late last month tried to expel the head of the UN body, the International Committee Against Impunity in Guatemala (CICIG), only to be overruled by the country's top court. The CICIG and prosecutors want to investigate allegations Morales had failed to declare $1 million in campaign funding to his party in 2015, the year he was elected to office. Morales, a former TV comic with no previous political experience, became president on promises to clean up corruption. His predecessor, Otto Perez, was forced to stand down because of scandal revealed by the CICIG in which he and other officials allegedly received bribes to help businessmen avoid paying import duties.